Can you help us to identify any of the men in this photograph? A black and white photograph of Central Garage The Davidson Motor Company Ltd. 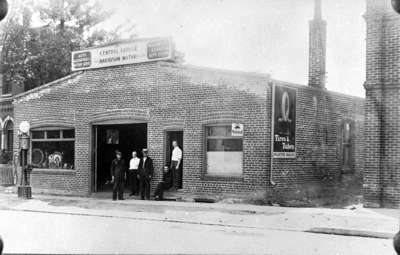 This garage was located at 103 Dundas Street East. It was built by William Davidson about 1917 on the south side of Dundas Street east of the Dominion Bank at Brock Street. Later the garage became known as Whitby Motors Ltd. Mr. Davidson operated the garage until his retirement in 1962. On sign above store: "Central Garage The Davidson Motor Co. Ltd. Auto Accessories and Battery Service. Machinist and General Auto Repairs." On the window is a advertisement that says "Mobiloil". On the side of the building is a poster style advertisement that says "tires and tubes selected dealer". Central Garage, c.1922, Photographer Unknown. Whitby Archives 01-000-070. Scanned from a 1973 copy negative.